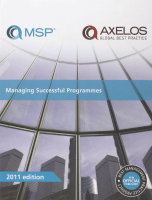 The official guide to the MSP Programme Management Methodology. This 2011 edition of Managing Successful Programmes combines rigour and flexibility, helping all organizations - public sector and private, large and small - achieve successful outcomes from their programme management time and time again. With change a pressing reality for all organizations, successful programme management has never been more vital to success. Extensively updated and revised, this MSP manual reflects the latest changes and developments in best practice along with practical advice. This title gives the framework and strategies of Programme Management. It provides a detailed definition of how to handle the complete programme and considers key principles including leadership, benefits management, stakeholder management and communication. Risk management, programme planning and control, business case management and quality management issues. Note: This publication is available in a PDF format. Find out more about Accredited MSP® training.